Social media analytics tools are very important for determining how exactly your ad campaigns are functioning. Without these tools you will not be able to understand if your campaign is successful or not. If there are any problems you will be able to find it out with the tools and correct it. Hence, the importance of social media analytics tools is very high. 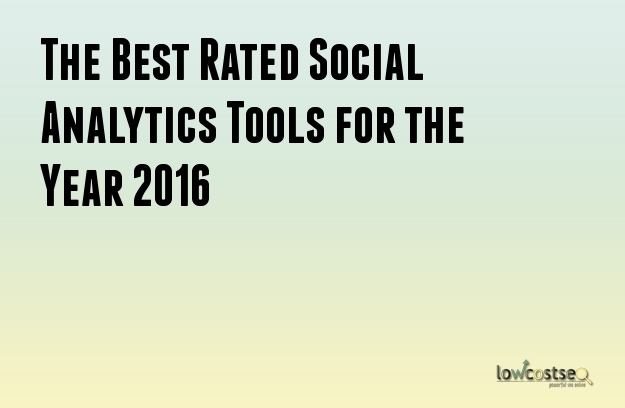 There are also many other advantages of using social media analytics tools. You can use them to run campaigns through one site and determine the type of traffic and demographics that are attracted by your site and the content. You can use the tools to find out the success of your content strategy. The tools can also be used to organize the work flow in a way that is convenient to you. Spredfast: With the help of this particular toll, you will be able to prepare reports on some of the metrics that you find. It will make management of the campaigns very easy. You will be able to maintain a content library with the help of this tool. There are not many tools in the system as of yet, but it is a very good support to getting your content organized. The tool can be used successfully in various social media portals like Facebook, Flickr, Twitter, Google Plus, LinkedIn and others. Expion: This program is very versatile and it can be used for a lot of purposes. This social analytics tool will help you do it all. It is similar to WordPress which means that it is quite easy to use and understand. You can use it for scheduling posts in a number of sites and it will get done on time. The tool can be used with a variety of social media portals including Facebook, Google Plus, Twitter, Instagram, Foursquare, Linkedin, Pinterest, etc. You can use it to analyze and monitor the content accurately. Your brand’s social media presence will also go up immensely and the visibility will improve. This tool is one of the best in the web today. Gremin: This is considered to be a low end product, but it also has advantages of its own. The social media tools are usually quite expensive, but this one is quite economical and afforded by majority of the clients. It is easy to navigate and it also does a quite effective job when it comes to posting. The tool can also be used for translation of foreign texts. It provides social media compliance enforcement which is another huge advantage. You can decide which social media tool is best for you depending on your requirement and your budget. All these tools have their own advantage and with them you will get best results for your site.